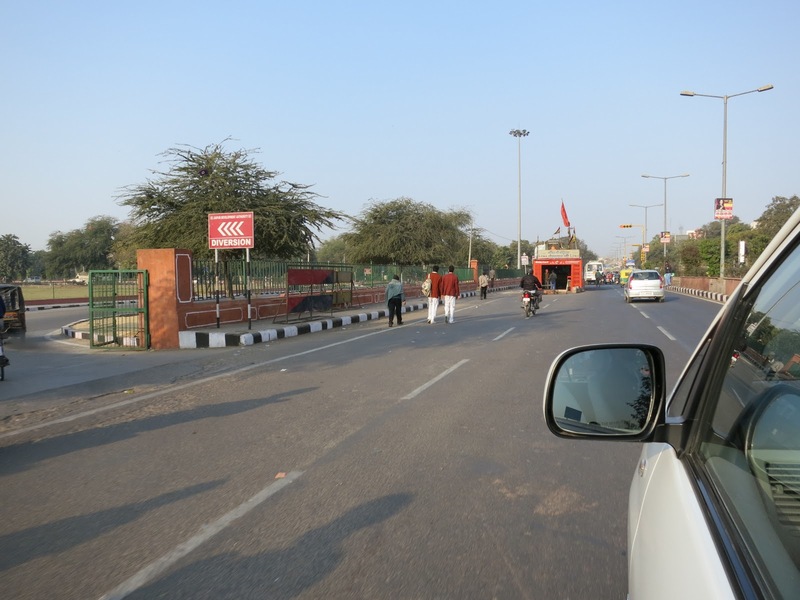 We left Jaipur and began our 7 hour drive towards Jaisalmer. 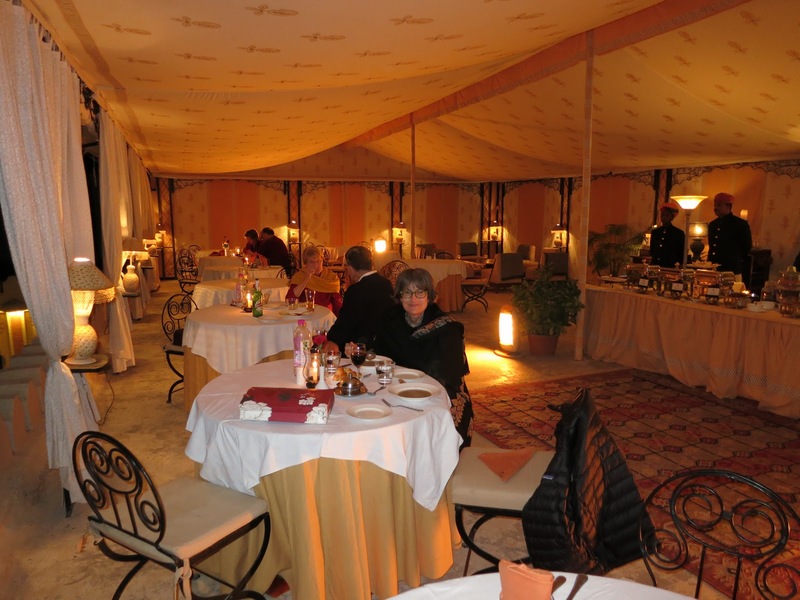 We plan to spend the night in Rohet. From Rohet it is a 5 hour drive to reach Jaisalmer. 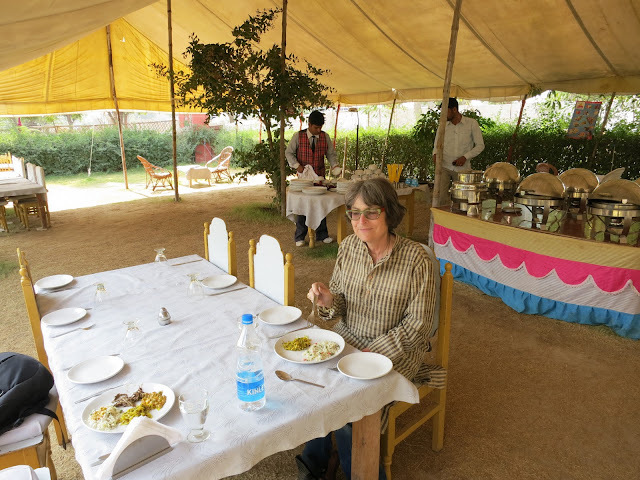 On our last visit to India we were supposed to stay at Rohet, but our plans changed and we never made it. We didn’t know what to expect in Rohet, but wanted to see what Rohet had to offer. The ride from Jaipur was like a 7 hour Hindi class for us. I would attempt to read signs, advertisements, writing on trucks and our driver would correct my pronunciation and translate words to English if necessary. It was great fun for me. Many of the signs written on the back of the outlandishly decorated trucks were prayers or religious sayings that were difficult to translate. One of may favorites was Karum Hei Puga Hain (written of course in Hindi) that loosely translate to: “What you do in this life is the prayer” suggesting that your actions mean more than rote repeating of prayers. We got into a very complicated and difficult discussion about the kickbacks between merchants and drivers and guides. This is an area where we feel very uncomfortable, but it absolutely a part of the Indian tourist equation. Stores kickback money to guides and drivers that bring customers to them. Guides get more than drivers. The issue becomes when tourists like us, who repeatedly return to India know where they want to shop. In that case the guide or driver is like a taxi, they aren’t suggesting where we shop, we are telling them where we want to go. Stores recognize us as repeat customers and attempt to cut the driver or guide out. Meanwhile the guides are trying to take you to places they know they can get a kickback. It is very tricky to negotiate this and not feel uncomfortable. 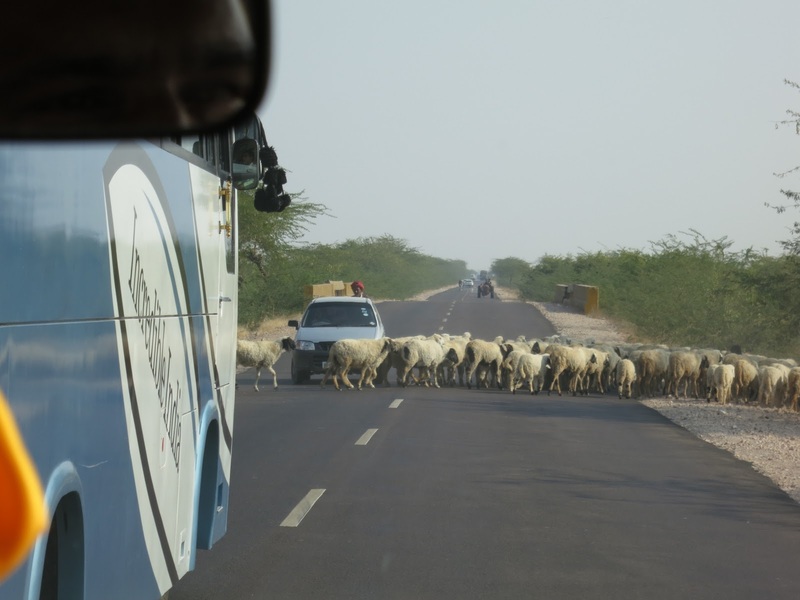 This became a major point of discussion as we drove the Rajasthan desert towards our stop at Rohet. Rohet is a typicaly poor Rajasthan village, dirt roads, cows and goats and dogs run loose, garbage everywhere, nothing is particularly appealing. 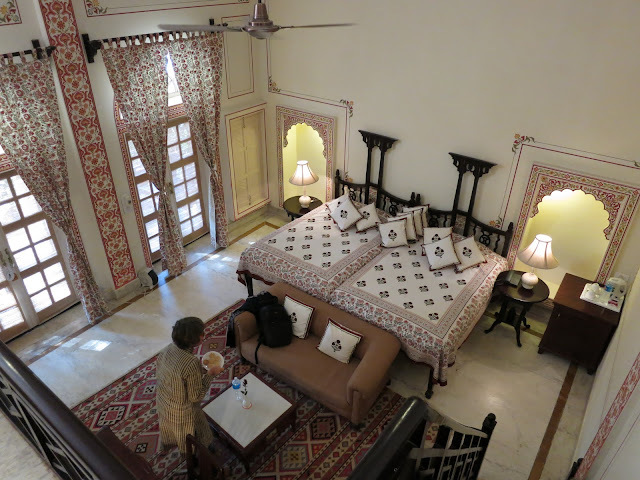 You then enter the princely house where we are staying. It is called Rohet Ghar (Ghar is the Hindi word for House). This house is an estate. It has been in the same family since 1622! They still live here in the house we are staying in. The Ghar looks like it has been designed with the intention of being in Architectural Digest, Indian Version. Maharaja’s are Kings. Under them there were the equivalent of English Dukes. They are called Thakurs. A Thakur ownes several villages and was very powerful and wealthy. 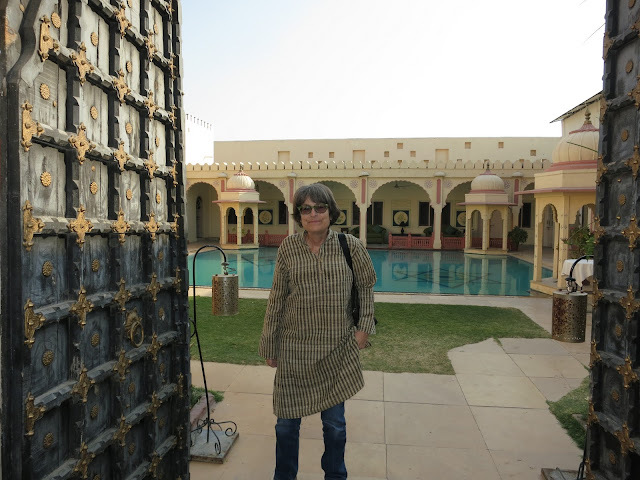 The Thakur that owned Rohet Ghar owns 12 villages, and has turned part of his immense and beautiful Ghar into a guest hotel. He is extremely warm and sophisticated – he greeted us and we played for quite a while with his wonderful dog. The Ghar has many wings, gardens, and pools. Everything and I mean everything is perfectly restored and decorated to perfection. Nothing is gaudy, or overdone or in need of repair. We went to the spa and had a 90 minute massage followed by a bottle of Indian wine. 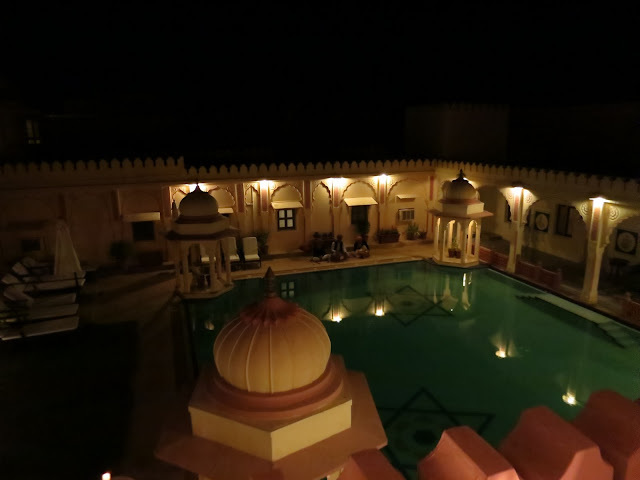 We then ate dinner on the roof of Ghar, overlooking the pool serenaded by traditional Rajasthani music. The food was fantastic and the night was magical. This is everything you can hope for on a trip to India.